Jennifer Bridges, PMP, shows how tracking these key performance indicators (KPI) will help keep the team productive and the project on track. Here’s a shot of the whiteboard for your reference! If you’re looking for a way to track the progress of your team, there are metrics that can help. Jennifer Bridges, talked about the eight essential KPI metrics for teams. Before getting into that, though, she wanted to define some key terms. KPI is an acronym that stands for key performance indicator. It is a measurement that demonstrates how effectively a company is achieving its key business objectives. KPI metrics are often monitored with online dashboards or tracking templates. Organizations use KPI metrics to evaluate their success in reaching targets. When you use KPIs on projects, you’re measuring team progress. Jennifer continued to explain the meaning of KPI by noting that there are two different types: quantitative and qualitative. The difference between the two, in terms of what they measure, is listed below. Write a Clear Objective: What are you trying to measure and control? Share with the Team: Make sure those objectives are communicated throughout your project team, so everyone is on the same page. Update: Regularly update the team, as objectives can change. Review Weekly: Meet weekly to make sure that as the project progresses, everyone stays informed on what you’re measuring and how. Make sure the KPIs you created are aligned with the organization and project. Make sure they’re achievable and not unrealistic for your team. Make sure that they’re actionable. Pro-Tip: If you use an online project management software, you’ll get live data, which means your team is able to update in real time. Not only does this lead to more accuracy, but with a real-time KPI dashboard, you can see the project’s progress at a glance with easy-to-read graphs and charts. 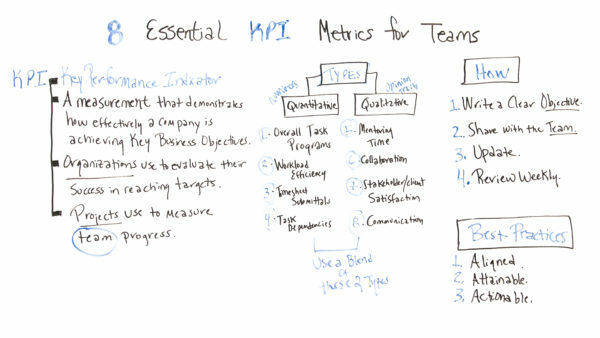 Today, we’re talking about Eight Essential KPI Metrics for Teams. But first of all, I want to talk about what a KPI is. I want to talk about two different types. I also want to talk about how we create them and a few best practices. So first of all, what is a KPI? So, KPI is a key performance indicator, and it’s a measurement that demonstrates how effectively a company is at achieving key business objectives. Organizations also use these to evaluate their success in reaching targets, but we can also use these in projects, and when used in projects, we’re looking to evaluate and measure the team progress. So, let’s look at two different types. We have quantitative KPIs and qualitative KPIs. And when we’re talking about quantitative, we’re measuring those KPIs using numbers. When we talk about qualitative, we’re measuring the KPIs by opinions or traits. So, the four quantitative ones that we commonly look at are the overall tasks programs. We’re also looking at the workload efficiency of the team, as well as timesheet submittals. How good or how regular and how accurate are they at submitting their timesheet? And also, looking at some of the task dependencies. And when we look at qualitative, we’re considering how much time is spent with mentoring. We’re looking at collaboration and how much time is spent with collaboration. We’re looking at stakeholder and client satisfaction, as well as communication. So, we want to use a blend of these two types. So how do we create these KPIs? How do we come up with them? Well, first of all, we write a clear objective of what we’re trying to measure and control. And then, once we do that, we share that or those with the team. And then we update those on a regular basis and we review them weekly. So, a few best practices are you want to make sure that the KPIs that you create for your project or your team are aligned with your project and your organization. You also want to make sure they’re attainable by your team members so they don’t become demotivators. And you want to make sure they’re actionable. Now, with project management software, these can be managed and updated real-time. And when your team members can update them real-time, there is a tendency towards more accuracy. So, you can also use these in your dashboards, have a visual view so, not only you as the manager or project manager, but also your team members can have insights into what’s going on on the project and the team progress. So, if you need a tool to manage and track your KPIs, keep them visible for your team, then sign up for our software now at ProjectManager.com.